The 1986 Tour de France is remembered as being one of the best editions of the race in the past few decades when Greg LeMond won after repelling repeated attacks from his own team-mate Bernard Hinault. Even though LeMond became the first and to-date the only US rider to win the Tour, he wasn’t the first North American to wear the yellow jersey. Earlier on in the same Tour, the 25 year-old Canadian Alex Stieda had claimed that honour when he not only took over the yellow jersey on the second stage of the race, but also the red, white, polka dot and combination jerseys. Stieda was a member of the 7-Eleven team who had been invited to that year’s Tour, becoming the first American team to take part in the race and not too much was expected of the first-timers. However, they caused a number of surprises. Stieda was the first 7-Eleven rider to make an impact. 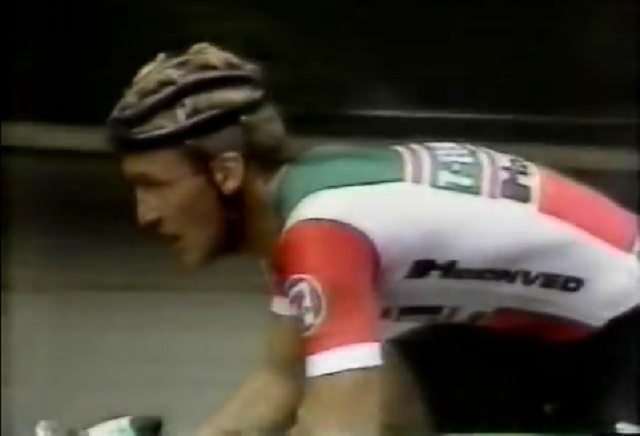 The Canadian had gone clear alone early on the short 85-kilometre stage from Nanterre to Sceaux with five riders later bridging up to him including the Australian Phil Anderson. Stieda managed to stay clear to take a number of the Catch sprints on route which would stand to him at the end of the stage. 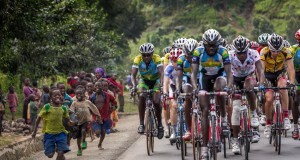 Behind, the peloton started to chase furiously but they had left it too late. Pol Verschuere of Fagor won the stage as Stieda finished in fifth place, just ahead of the peloton. Stieda had done enough to enable him to leapfrog Thierry Marie into the lead. The rider from Vancouver held on to yellow for just one stage as Thierry Marie again took over leadership after the Systéme-U team won the team time-trial that afternoon. Unfortunately for the 7-Eleven team, they lost time during the test when Eric Heiden crashed. Stieda did hang on to the polka dot jersey for a few more stages though until Regis Simon moved into the lead in the mountains classification. In addition to his stint in yellow, another 7-Eleven rider would taste success as Davis Phinney won the third stage from Levallois-Perret to Liévin. Stieda would go on to finish his one and only appearance in the Tour in 120th place. He continued to race with the 7-Eleven team until 1990. He would later switch to mountain biking. Here are some highlights of the stage where he took over the yellow jersey. This was the first year I followed the Tour from start to finish. To see a fellow Canadian in yellow was amazing. To see him almost eliminated that same day, not so much. I remember Lemond trying to make like it was no big deal but you could tell he was not happy that it was not him as the first North American in Yellow. Stieda also might be the first to wear a skinsuit in a road stage at the Tour, which is now common with the combined jersey/shorts that teams are using. He went on to ride for Coors Cycling Team and had some great results here in North America.